Last December, I declared 2013 my Year of Randonneuring. After several of years of reading about other friends’ exploits on their steel bikes — riding miles and miles all throughout the Bay Area, sometimes through the night (and later I learned, even longer) — I succumbed to my perceived romance of embarking on my own long-distance endurance adventures. But first, I needed my own randonneur-friendly steed. As I didn’t have money at the time to get a whole new rig — and my Ebisu touring bike was too heavy for the task — I cobbled together a rather kludgy solution with my aluminum El Camino CX bike. I zip-tied water bottle cages to the frame (this bike was built for racing, so it didn’t have bosses), built up a front wheel with a Schmidt generator hub (check out that oh-so-pro bundle of wiring for the Lumotec IQ light zip-tied to the rack) and loaded up my cockpit accordingly. The pièce de résistance was my new Gilles Berthoud Marie Blanque saddle. 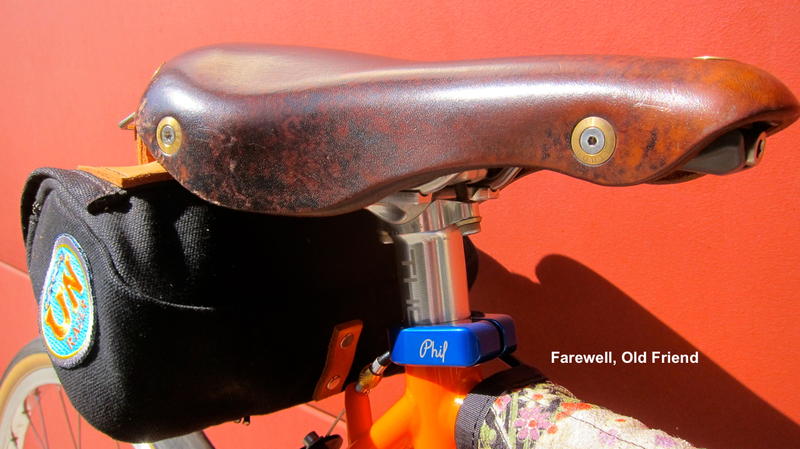 I’d admired these stylish French saddles for years, and now, after coveting them from afar — it was on my Frankensteined bike and matched my new handlebar and saddle bags (the former attached with an easily removable Nitto F15 rack) and bar tape. Little did I know that this would begin a seemingly never-ending timeline of woe. Despite the fact that I had bought a women’s specific version — which meant it was shorter than its male counterparts — as I continued to ride longer and longer events, my right knee began to protest with the ever-increasing mileage. At first, I chalked it up to the fact that I had never ridden over 110 miles before this year and didn’t like this sudden uptick in distance. I contemplated quitting my first 600k due to the pain, but somehow managed to rally through the magical combination of companionship, caffeine and ibuprofen. Anyway, I finally ended up with the same saddle on my randonneur that I use on my road bike: a Fizik Aliante. Spec-wise, it’s narrower than any Brooks or Gilles Berthoud saddle, and long enough so that I don’t have the setback issues. I went on a 40-mile hilly road ride yesterday and had a minimal amount of pain (some of it might be lingering from an old injury or my newer ones.) It may remain a mystery as to why the women’s specific B-17 on my Ebisu works just fine — but remains allergic to my randonneur bikes. And I’ve never ridden on a Fizik saddle over 150 miles, so I’m hoping I’ll be as comfortable on it as its French predecessor, accompanying knee pain notwithstanding. I have no doubt that 2014 will be another year of ever-evolving experimentation.